Today, July 26, 2016 marks the 10th anniversary of the passing of Louise “Miss Lou” Bennett-Coverley – someone scholar, Mervyn Morris, describes as “one of the most influential figures in Jamaican culture.” He has edited several volumes of Miss Lou’s work and wrote an insightful article, “Remembering Miss Lou,” in Caribbean Beat magazine, published in the November/December 2006 issue. Professor Rex Nettleford, Jamaican scholar, social critic, choreographer, co-founder of the National Dance Theatre Company and vice-chancellor emeritus of the University of the West Indies, describes the work of Miss Lou as unique. He died on February 2, 2010, in Washington, D.C., one day before his 77th birthday, after suffering a massive heart attack a few days before, and being placed on life support in hospital there. I wasn’t fortunate like my friend, Kevin Kevin A. Ormsby, to appear on Miss Lou’s weekly television show for children, Ring Ding, which she hosted from 1970 to 1982. But, as a child I watched the show every Saturday to see the talent of the kids and to learn something new about Jamaican culture. It wasn’t unt il I came to Canada that I met Miss Lou in 1994 and developed a friendship until her death in 2006 at the age of 86. In 1994, I was working at CJRT-FM (now Jazz FM), which was at the corner of Mutual and Gould streets in downtown, Toronto. I was there working as an administrative assistant dealing with cassettes of academic courses/lectures and workbooks that were mailed to students across Canada – part of Open College (the lectures/courses were also broadcast on CJRT). I kept pining for a return to broadcasting – which I did at Radio Jamaica (RJR) before coming here – so in the fall of 1994, I decided to interview Miss Lou for one of CJRT-FM’s current affairs programs. Christmas was approaching and I wanted to re-visit old time Christmas traditions in Jamaica – Jonkonnu, Christmas morning service, Christmas market, etc. Miss Lou was very receptive to the idea and invited me into her home to record the interview, which was aired that December. Jeff Zabudsky, now president of Sheridan College, worked at CJRT at the time and was very helpful in my operation of the Marantz recorder (remember those heavy tape recorders? Those were the recorders I used at RJR and later on at CHRY in 1995). 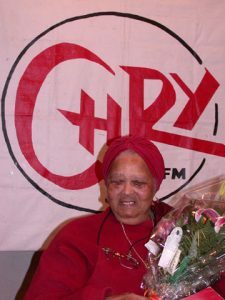 From 1994 until Miss Lou’s passing on July 26, 2006, I would attend various events and see her or interview her about various aspects of Jamaican culture when I worked at CHRY (now VIBE 105FM) at York University. In one of my conversations with poet and social entrepreneur, Dwayne Morgan, (who will be off to Ghana in August to share his work with children at libraries there), we arranged to visit Miss Lou at her home in Scarborough (photo attached). I called her up and told her about Dwayne’s work and she was happy to welcome us so we set the date, went, and had a wonderful time. know anything about Miss Lou you’d know that people are drawn to her and she draws people to her so visiting her home means you might run into the mouth-watering flavours of escoveitched fish and other Jamaican food from the kitchen where Becky or someone is cooking; Mas Eric (Eric “Chalk Talk” Coverley), her husband, or as she affectionately called him, “Rico,” is doing calligraphy; Rosie “braata dawta” is nearby to assist, and others are visiting. Mas Eric died in 2002 at the age of 91. 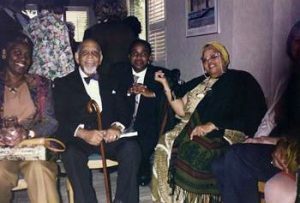 Her get-togethers were familiar places to see veteran RJR, JBC and later CBC journalist, Keeble McFarlane, the late Dwight Whylie, The Heritage Singers and more. Of course there were friends who held her dear such as Joan Andrea Hutchinson, Marjorie Whylie (musician on Ring Ding), Leonie Forbes, Charles Hyatt, Barbara Gloudon, Oliver Samuels, Owen Blakka Ellis, Sandra Whiting, Carolyn Cooper, Letna Allen-Rowe, and so many more. Over the 12 years I knew Miss Lou, there were people who were constants in her life whenever I saw her in public: Carl Henry, Carolyn Goulbourne, Rosie Johnston (“braata dawta), and Fabian Coverley. Fabian and Pamela Appelt, who was the Citizenship Court judge at Miss Lou’s Canadian citizenship ceremony, are the executors of Miss Lou’s estate. Earlier this year, I donated the interviews I did with Miss Lou and events I recorded at which she spoke to the Louise Bennett Coverley Fonds at McMaster University Library – which will be available to anyone in the world who is doing research on her. It’s easy to draw upon Miss Lou’s work for reference in any situation. Recently, I wrote about a documentary on Nanny of the Maroons entitled “Queen Nanny: Legendary Maroon Chieftainess” for a Jamaica Independence Feature in the Gleaner, North American edition. Miss Lou wrote a radio monologue, “Hero Nanny,” broadcast in October 1975 shortly after the government declared Nanny a national hero. “The thing I loved the most about Miss Lou is a lot of the national movements and black power movements and so on, they had this ideal like we’re perfect. Miss Lou is like, no, we chupid, we dis, we dat, we every ting but yet we love all a dat because we’re human. I think Miss Lou’s impact — because in the society if yuh poor, yuh dis; if yuh darker skin, yuh dis; if yuh live a country, yuh dis, whatever – Miss Lou just loved everything, everybody, Jamaican. “For me, she was just that figure that just was so healing and just so ordinary. It’s just that if you are alive you are beautiful, your language is beautiful, you’re African – that was her allegiance,” says Allen. On Sunday, August 7, storyteller, Letna Allen, who follows in Miss Lou’s footsteps will present “Memba Miss Lou” at Revivaltime Tabernacle – the church where a Service of Thanksgiving for the Hon. Louise Simone Bennett-Coverley (September 7, 1919-July 26, 2016) was held on Thursday, August 3, 2006. The officiating clergy were: Bishop Dr. Audley James, Dr. Pat Francis and Easton Lee. The tributes came from: Michael Lashley, then Consul General for the Republic of Trinidad and Tobago, Sandra Carnegie-Douglas, President, Jamaican Canadian Association, and Carol Wong representing the Tsung Tsin Association of Ontario. Denise Jones performed one of Miss Lou’s poems and Miss Lou’s dear and longtime friend, Maud Fuller, delivered the eulogy. Maud died here in Toronto on January 17, 2013 after suffering a stroke on December 15, 2012, one week after celebrating her 79th birthday. She also played a role in the popular “The Lou and Ranny” radio show. I just opened one of Miss Lou’s books and there’s a card from her to me in it. The card has a painting of her, (“Miss Lou” – from an acrylic painting by Darrell McCalla, 1994), with the Jamaican proverb: “Monkey mus know weh him gwine put him tail before him order trousiz.” Translation: Be prepared. Meryn Morris’ article in Caribbean Beat is worth reading again and again – truly a tribute to Miss Lou.